Welcome to Mekong Delta to enjoy the peace of the life in real countryside. Mekong Delta is a watery landscape in the south of Vietnam. Visit Mekong Delta to enjoy the beauty of green rice fields stretching to the horizon. Coming to Mekong Delta, you have chances to explore the system of crisscrossed brown canals and rivulets by boats. Enjoy the wealth of the land “God-blessing” with thousands of orchard gardens and specialties. Enjoy tropical fruit, coconut candies and honey tea. Visit Cai Rang Floating Market. Massive amount of merchant’s boats join the sale. Explore tiny villages perched along tranquil tributaries, browse the goods at a colorful floating market, and taste silky sweet coconut candies washed down with honey tea. Tiptoe across a creative bridge, watch noodle makers at work, and see traditional folk music performed by locals on this 2-day tour. At appointed time (approx 07:30 to 08:30), our guide from Vietnam Travel Group will greet you at the hotel's lobby before transfering you directly from Ho Chi Minh City. Enjoy scenic ride out of the city. Watch rice paddies flecked with charming farms pass by as you make your way to the quaint fishing village of My Tho. Board a boat bound for the islands of the Tien River, and then cruise to Ben Tre to check out dense coconut groves. Taste decadent coconut candies and sip hot mugs of honey tea before grabbing a scrumptious lunch featuring freshly caught fish and river shrimp. Spend your afternoon watching folk music performances and walking around the countryside. 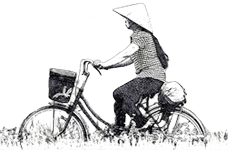 At night, take a quick ride to Can Tho where you can turn in for the night at a cozy hotel. noodle makers create delicate vermicelli, visit a local village, and get the chance to test your balance as you cross the river on a bamboo span known locally as a "monkey bridge". Tuck into a scrumptious lunch, do some last-minute shopping at Can Tho Market, visit Vinh Trang Pagoda and then take a final ride back to Ho Chi Minh City, where you can get dropped off at your hotel. Had a great 2 days with Tranth on the Mekong Delta. He looked after us very well and showed us some amazing sights and explained how life goes on in Vietnam. Highly recommend this Private 2- Day A Glimpse Of Mekong Delta tour and our tour guide Tranth of Vietnam Travel Group. Thank you.